Honoring our mission statement, “Promoting a culture of excellence, dedication, commitment to community, involvement and passion in caring for a stronger (nursing) foundation today for the next generation", it is with great pleasure that I announce on behalf of thirty six chapters across the USA and more than four thousand active members of the Philippine Nurses Association of America, our full support of the initiative to establish an Office of the National Nurse. We believe, as we know you do, that it is necessary for nurses to provide quality, safe, and compassionate care to all Americans and this must include prevention. Thank you Representative Christine Canavan for introducing and carrying forth the following resolution into the Massachusetts State House of Representatives. Representative Canavan states on her website "In our great country, professional nurses are a valuable resource. Nurses need to have a recognized and accepted voice in public policy. At the local level, an individual nurse's involvement, especially in areas that are politically sensitive to the profession, can be more important than many realize. And I hope the Office of the National Nurse will encourage my nursing colleagues to give of themselves to their communities and share their special insights." The National Nursing Network Organization would also like to extend its thanks and gratitude to Rep. Canavan's legislative assistant, John Harding, and to the student nurses of Mt. Wachusett Community College for contacting Rep. Canavan and explaining to her the need for an Office of the National Nurse! RESOLVED, That copy of these resolutions be forwarded by the Clerk of the House of Representatives to the President of the United States, the presiding officer of each branch of Congress and the members thereof the Commonwealth. Please accept this letter on behalf of the 8,500 members of the American Association of Nurse Assessment Coordinators (AANAC) and the 500 members of the American Association of Nurse Executives (AANEX) in support of your continued efforts in recognizing the important role nurses play in being able to increase the preventative care in this country. 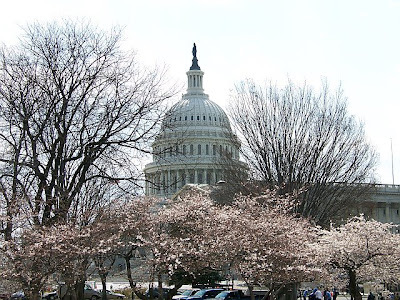 Your support to establish symbolic national nursing leadership for a new philosophy and cultural shift to prevention in US Healthcare is essential and particularly of importance to our aging population. We believe that re-titling the Chief Nurse Officer of the USPHS to become the “National Nurse” will provide the authority, impetus, and recognition needed nationally to promote prevention. In addition, we commend you for your efforts to help raise the visibility of nursing, provide guidance for state and local leadership in mobilization of volunteer nurses, and to enhance prevention and improve health outcomes. With the political climate being as challenging as it has been, it is good to recognize our mutual commitment to ensuring adequate health care for all Americans. We believe having a prominent and recognized nurse will also better facilitate the dissemination of accurate information that the ANNAC and AANEX can use to improve the quality of care for residents and patients. We look forward seeing legislation introduced to achieve these goals and would like you to feel free to contact us should you need further support. So good to see you are advocating for better care for all patients and residents. The NNNO Board of Directors were delighted to have the opportunity to share a poster board at the Medical Reserve Corps Annual Leadership and Training Conference held in Portland, Oregon April 8-11th. Special thanks to Lori Moss BSN, RN who helped with the design of the poster and the many participants of the conference who stopped by and shared their thoughts. The comments we heard were overwhelmingly positive-all were in agreement that the status quo is not working and believe national nursing leadership to encourage participation within the MRC would be a way to enhance health promotion and prevention efforts. Based on the ubiquitous presence of nurses in all communities and the high degree of trust bestowed on them, a strong nursing presence in the MRC can play a major role in prevention and health promotion. Current efforts to increase enrollment in schools of nursing are straining the ability of communities to provide an adequate number of clinical sites to prepare students in public health. Enlisting student nurses to volunteer in their communities fosters awareness of the role of the nurse in public health and increases the likelihood of continued volunteerism after licensure. A proposal for including student nurse volunteers in the MRC as a vehicle for delivering illness prevention and health promotion education and a strategy to incorporate local MRC and student nurse volunteers in community health fairs will be presented. I have been an avid supporter in the initiative of a national nurse. This article published in the Dec. 3 issue ("National Nurse Debate Fuels Concerns") outlines pure lack of communication. It is disconcerting to say the least. I can't help but perceive this division as if there are two sides with opposing views. Are we not, as nurses, here for the greater good of the patient and the integrity of our profession? If I may, for a moment, go back to the foundation of nursing and read the words of Florence Nightingale's pledge "I will endeavor to fulfill my rights and privileges as a good citizen and take my share of responsibility in promoting the health and welfare of the community". Let us contemplate an important provision in the ANA code of ethics: "The principle of respect for persons extends to all individuals with whom the nurse interacts. The nurse maintains compassionate and caring relationship with colleagues and others with a commitment to the fair treatment of individuals, to integrity-preserving compromises, and to resolving conflict". After reading the national nurse debate article I was embarrassed for my profession. The bantering between the "two sides" is ludicrous. We need support for our patients instituting health care preventative actions and to ultimately address our nursing shortage. Both issues are threatening the development of our profession. I cannot speak for my fellow RN's but I have never heard of Carol Romano until this article. It seems to me the national nurse, unequivocally, must be a visible force in the public. A force that provides leadership and brings the honor and prestige of the nursing occupation to the public's attention. How can we divert our eyes from the overwhelming need for prevention and swift action during crisis? I trust if the ANA and affiliates join forces with the innovative ideas of Teri Mills we may have a solution. 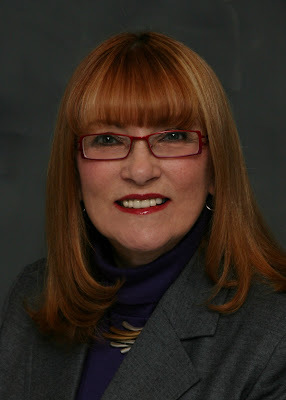 I challenge readers to visit the National Nurse Website www.nationalnurse.org." 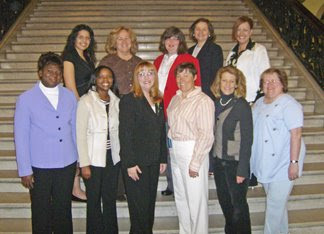 State Rep. Christine E. Canavan (D-Brockton), front left, invited Devens Practical Nursing students, assistant professor Collene Thaxton, Director of Nursing Nancy Duphily and Dean of Health Sciences Eileen Costello to the statehouse to recognize their efforts in the Office of the National Nurse initiative. Last Fall, nursing students attending Mt. Wachusett Community College decided to write their state legislators and request legislation supporting the Office of the National Nurse initiative. 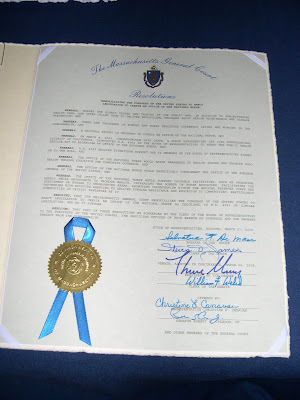 State Representative Christine E. Canavan (D-Brockton), who is also a nurse, found their request to be compelling, and introduced a resolution memorializing the Congress of the United States to enact legislation to create an official Office of the National Nurse. The students believe a National Nurse is necessary to be a prominent visible symbol to generate a cultural shift to prevention at a time when our nation is seeing record numbers of chronic conditions such as obesity and Type 2 Diabetes. Thanks to Representative Canavan's leadership, twenty-two members of the House of Representatives and three Senators signed on to make this a joint resolution. The legislation passed both chambers without dissent. MWCC President Daniel M. Asquino stated, "As a college, we emphasize the importance of civic engagement, and this initiative represents student involvement at its best. I am very proud of our students and their professor, Collene Thaxton, for raising the awareness about the need for an Office for the National Nurse to ensure improved health care throughout the country." The National Nursing Network Board of Directors commends the leadership skills the students of MWCC demonstrated that will most likely benefit the nation's health as well as the future generation of nurses. There are presently two articles about the Massachusetts resolution. One appears in What's Up at the Mount, the MWCC newsletter and the other can be found at Enterprise News. Update for April 9, 2008: The Nursing Site Blog applauds the MWCC nursing students and also recognized the Oregon student nurses political activism at the NSNA convention. Congratulations to all our future nurses! Once again, the Office of the National Nurse earned recognition, this time as one of the Top 100 Academic Medical Blogs listed under the Nursing category. Criteria for selection included an academic and science-focused site that has real, researched medical information where one can turn to for expert advice and analysis.